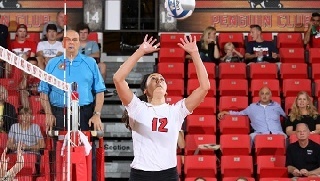 Youngstown State senior setter Val Jeffery has been voted Honorable Mention All-Horizon League in recognition of her final season, the conference announced on Tuesday. Jeffery ranked seventh in the Horizon League with 9.38 assists per set, and her 1,0004 total assists ranked sixth. The Pickerington, Ohio, native also ranked fifth in the league with 0.30 aces per set. Jeffery finished her Youngstown State career ranking fifth in program history with 3,217 assists over her three years at YSU. Additionally, she ranked second in assists per set at 9.87. Cleveland State's Grace Kauth was named the Horizon League Player of the Year and the conference's top offensive player, and Valparaiso's Morganne Longoria was named Defensive Player of the Year. The Horizon League Tournament will begin on Friday in Cleveland, Ohio.